A new screening method can detect twice as many women with ovarian cancer as conventional strategies, according to the latest results from the largest trial of its kind led by UCL. The method uses a statistical calculation to interpret changing levels in women's blood of a protein called CA125, which is linked to ovarian cancer. This gives a more accurate prediction of a woman's individual risk of developing cancer, compared to the conventional screening method which uses a fixed 'cut-off' point for CA125. The new method detected cancer in 86% of women with invasive epithelial ovarian cancer (iEOC), whereas the conventional test used in previous trials or in clinical practice would have identified fewer than half of these women (41% or 48% respectively). The results come from analysis of one arm of the UK Collaborative Trial of Ovarian Cancer Screening (UKCTOCS), the world's largest ovarian cancer screening trial, led by UCL and funded by the Medical Research Council, Cancer Research UK, Department of Health and The Eve Appeal. The trial involved 202,638 post-menopausal women aged 50 or over who were randomly assigned to two different annual screening strategies (multimodal screening or transvaginal ultrasound) or no test at all. The study, published in the Journal of Clinical Oncology, evaluated 46,237 women who continued to attend annual multimodal screening following the first screen. Their blood was tested once a year for CA125 levels and then a computer algorithm was used to interpret their risk of ovarian cancer based on factors including the woman's age, the original levels of CA125 and how that level changed over time. The serial pattern was compared with known cases of cancer and controls to estimate the risk of having ovarian cancer. "There is currently no national screening programme for ovarian cancer, as research to date has been unable to provide enough evidence that any one method would improve early detection of tumours. These results are therefore very encouraging. They show that use of an early detection strategy based on an individual's CA125 profile significantly improved cancer detection compared to what we've seen in previous screening trials. "The numbers of unnecessary operations and complications were within acceptable limits and we were able to safely and effectively deliver screening for over a decade across 13 NHS Trusts. While this is a significant achievement, we need to wait until later this year when the final analysis of the trial is completed to know whether the cancers detected through screening were caught early enough to save lives." 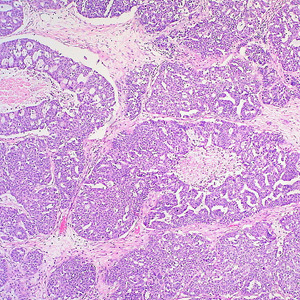 "CA125 as a biological marker for ovarian cancer has been called into question. Our findings indicate that this can be an accurate and sensitive screening tool, when used in the context of a woman's pattern of CA125 over time. What's normal for one woman may not be so for another. It is the change in levels of this protein that's important. My hope is that when the results of UKCTOCS are available this approach will prove capable of detecting ovarian cancer early enough to save lives." Previous large ovarian cancer screening trials have used a fixed cut-off for CA125 (more than 35U/mL) to identify a possible abnormality. But some women can have much higher levels and not have the cancer, while others with levels below this threshold could be harbouring the disease. A total of 640 women in the MMS group had surgery for suspected cancer, of whom 133 women had invasive epithelial ovarian cancers (iEOC). A further 22 women were diagnosed with iEOC within a year of the last annual screen. Results of screening in the ultrasound arm and the impact of screening on ovarian cancer deaths are anticipated later this year. Professor Patrick Maxwell, Chair of the MRC's Molecular and Cellular Medicine Board and Head of the School of Clinical Medicine of the University of Cambridge, says: "The UKCTOCS trial is a powerful demonstration of the type of research that thrives in the UK, where our best scientists, clinical researchers and healthcare workers work together and involve volunteers nationwide to improve health. These exciting initial results could eventually go on to form the basis of a national screening programme for ovarian cancer." Dr James Brenton, Cancer Research UK's ovarian cancer expert, says: "A blood test to find women at risk of ovarian cancer is an exciting prospect, but this work still needs to be tested in women to see if it can save lives. By tracking how the levels of the CA125 protein change over time we might have an early signal to detect tumours. Ovarian cancer is particularly hard to spot at an early stage so it's vital that we find ways to diagnose the cancer sooner." Athena Lamnisos, Chief Executive Officer of the Eve Appeal, says: "The 'C' in UKCTOCS stands for 'collaborative' and is a key aspect of both the name, and the ethos, of this trial - it is a powerful partnership of researchers, clinicians and of course the women who volunteered. The statistics around ovarian cancer are brutal and diagnosis often comes too late - either because a woman hasn't recognised the symptoms or because her GP doesn't. Our ambition is that this approach will be capable of detecting ovarian cancer at an earlier stage and save lives. These latest results are exciting and point towards the strides that we're making in more accurately predicting individual risk of developing cancer."